The recent World Cup prompted widespread protests across Brazil. In our 25th episode, we discuss why these protests took place, who participated, and how they connected to the uprisings of the last year. We share an audio collage of protest voices, an interview with Brazilian anarchists, and a Situationist-inspired critique of mass sports spectacles. The new green anarchist journal Black Seed appears on the Chopping Block, while a Ukrainian anarchist offers perspective on why things may not be so bleak there for anarchists as we thought. And there's hooliganism, a June 11th rundown, prisoner updates, reflections on the "global village," and Juggalos to boot! To learn more about the World Cup protests, check out the website of the Comite Popular da Copa. 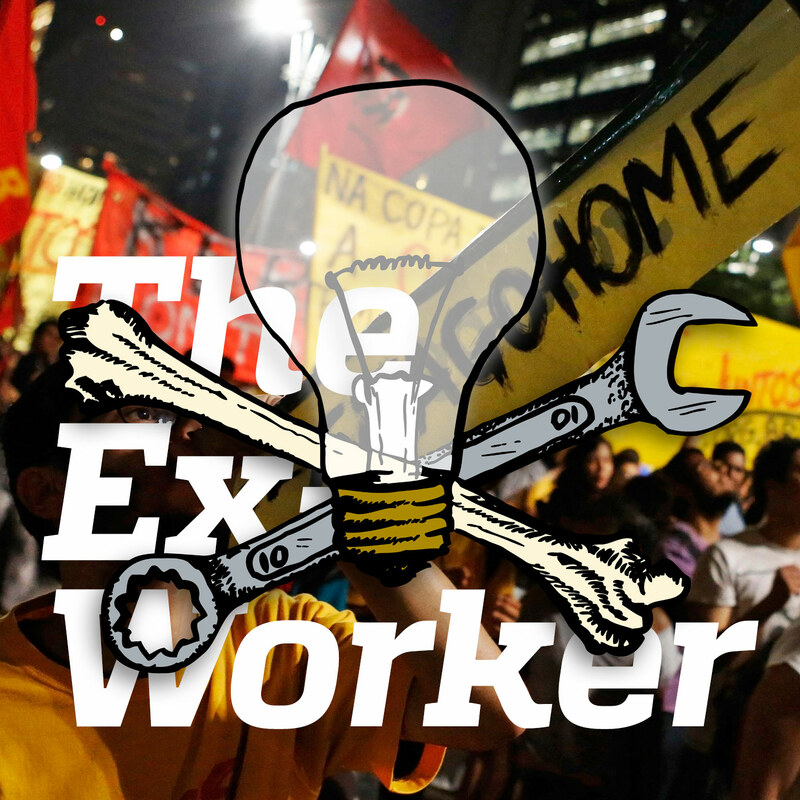 Don’t miss the interview with a Brazilian anarchist anti-cup activist conducted by our friends at The Final Straw. To see some stunning images of protest and supportive exploration of the context, check out this Vice Magazine documentary “Contra A Copa: The Other Side of Brazil’s World Cup”. Roar Magazine published an interesting discussion titled “The story of the unsung heroes: Black Bloc Brazil”. News reported on the Hot Wire included: Greek Prison strikes and solidarity actions, fascist attack and antifa response in London, pro-kangaroo animal rights attack in Canberra, Australia, fur farm raids in Malaysia, Italian anti-TAV attacks, tree sit in the forest, anti-construction blockade in Indonesia, more anti-Google/anti-gentrification actions in the San Francisco Bay area, court rulings that cops need a warrant to search your cell phone and about the no-fly list, Kevin Olliff and Tyler Lang’s indictment on Animal Enterprise Terrorism Act charges, June 11th actions in support of Eric McDavid and Marius (formerly Marie) Mason in Florida, Durham, Oregon, Athens, and Denver, plus actions and subsequent arrest in Bristol, UK, Cecily MacMillan’s release from jail, FBI visits regarding fugitive Donna Borup, Black Liberation Army prisoner Sekou Kambui’s long-awaited released from prison, and the ACLU’s loss of the lawsuit on behalf of Insane Clown Posse and Juggalos. The FBI recently visited the homes of activists in New York, Chicago and San Francisco, in connection with Donna Borup, who failed to appear for trial after her arrest at a New York anti-apartheid demonstration over 30 years ago. Remember, if you’re ever visited by the FBI or other law enforcement agents: 1) Say only: “I have nothing to say to you. Give me your card and my lawyer will contact you.” 2) Contact your nearest National Lawyers Guild chapter to let them know about the encounter. 3) Contact the Bay Area Committee to Resist Political Repression at: BACRPR [at] riseup.net and let them know what happened. In our listener feedback section, we shared this letter from an anarchist in Ukraine responding in part to the CrimethInc coverage and analysis of events there, published on the insurrectionist blog 325. We also mentioned this video statement from the Kharkiv Autonomous Worker’s Union about their new social and cultural center. Check out recently released Occupy Wall Street activist Cecily MacMillan’s statement on behalf of the incarcerated women of Riker’s Island. Here is a summary of recent repression in the anti-airport struggle of the ZAD in France since the February 22nd demonstration in Nantes. On the Chopping Block, we reviewed Black Seed, the new green anarchist journal from Little Black Cart. Here’s the “What is Green Anarchy?” piece that begins the journal. You can also read about some of its predecessors: Green Anarchy magazine — whose back issues can be read on this internet archive — as well as Do or Die and of course the Earth First! Journal. Upcoming events mentioned in Next Week’s News include: the Summer for Climate Justice Action Camp in Utah, 7/15 - 7/22; international day of solidarity with antifascist prisoner Jock Palfreeman, 7/25; Day of Action Against Fascism, 7/31; “Moving Beyond Capitalism” conference in San Miguel de Allende, Mexico, 7/29 - 8/5; protests against American Legislative Exchange Council (ALEC) in Dallas, Texas, 7/31–8/1;Philadelphia Anarchist Book Fair, 8/23; and an International Week of Solidarity for Anarchist Prisoners, 8/23–8/30.